Alberto Santos-Dumont was never about slowing down. In fact speed was the name of his game, setting records in aviation such as clocking 220 metres in 21 seconds back in 1906, which was a formidable achievement back then. Today, speed is very much at the forefront of the Santos de Cartier, an entire series of timepieces named (and inspired by) by Alberto Santos-Dumont himself. 2019 started off with a gorgeous blue dial version launched just a couple of weeks ago, and fans who have been waiting for a chronograph function will be pleased to know that Cartier will be releasing the new Santos de Cartier Chronograph that was just unveiled at SIHH 2019. Starting or stopping the complication is simple – look for the single button over at the 9 o’clock position. And if you need to reset the chronograph, that function has been integrated into the crown. 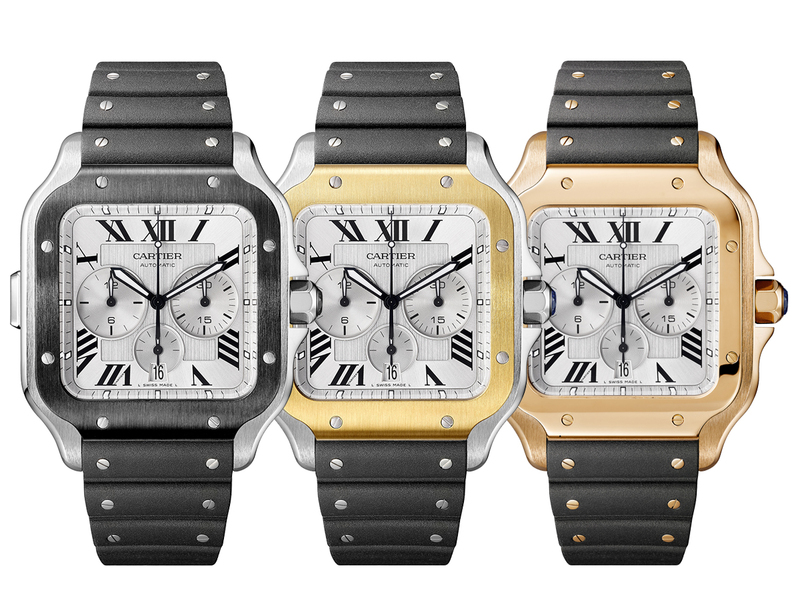 It is also worth noting that the Santos de Cartier Chronograph is fitted with an automatic in-house movement and comes in a single size known as the Extra-Large that’s bigger (51 mm), wider (43.3 mm) and thicker (12.5 mm) in comparison to the current offerings under the Santos de Cartier lineup. Prices will start from SGD12,400 for the Steel/ADLC, going upwards to SGD19,800 for the Yellow Gold/Steel variation and SGD34,300 for the one in full Pink Gold. Apart from steel and alligator leather straps, 2019 sees a contemporary version being introduced, one that comes in rubber (with metal screws) which makes for casual, everyday wear. In addition, the rubber straps come with a brand new push-button deployment ‘C’ buckle that allows for easier fastening and unfastening, which is another step up in terms of comfort, ease of use and security. Do not rush to your nearest Cartier boutique just yet, the Santos de Cartier Chronograph is only set to launch in Singapore come April 2019.